Skateboarding has been a major part of San Francisco’s culture for many years, and recently it has spread it’s influence to Oceana High School. Many Oceana students have been skating since they were young, while others have just recently started. Skating is a fun outlet for anyone who wants to try it, and there are so many fun places for it. Various locations can be found in San Francisco for skating, and even Pacifica itself has it’s own skate park. San Francisco has a number of areas that are perfect for street skating, as well as a plethora of skate parks. Height Street, when it’s not too busy, is a great area to skate on the street in between shopping, or if you want to get more distance in, you can skate around the Market Street area. Another fun spot is along the piers, which has a stunning view as well as smooth roads, perfect for smooth skating. 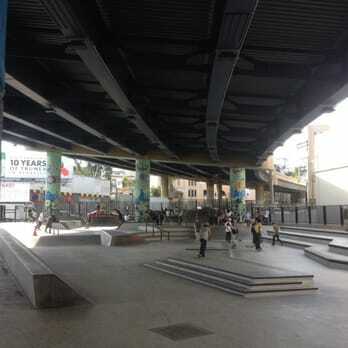 The skate park under a bridge located on Central Fwy, just outside the Mission district in SF, is perhaps one of the city’s most popular skate parks. This skate park is suited for both beginners and more advanced skaters with its welcoming environment. The city is the perfect place to skate for hours with friends or even by yourself, if you prefer. In fact, many beginners would rather practice alone. Gina Rodriguez, a student at Oceana, said, “I rarely go to the skate park because I’m terrified of judgement”. However, the skating community here is actually pretty nice and welcoming to all skaters. The first step, of course, is to get a skateboard. You can buy a fully complete one or pick out individual pieces and build your own. There’s an infinite amount of different designs to pick from, even just for the deck! Asking an employee at Zumiez or other skate shops is probably your best bet to figure out which brands and styles are the best fit for you. To start learning, try finding some friends who skate that can give you tips or look up some tutorials. Find an area with smooth, mostly flat ground, and get started!